Award x 2 = Super Sweet Blog & Versatile Blogger – The Worst Mom Ever! I got back from my vacation to find that I have been nominated for two different awards by three different people!! Wooohooo!! Yay Me! I am still a very new blogger and it blows my mind that people actually read this stuff. I mean, I think its great stuff but for others to not only read it but nominate my blog for these awards is just wonderful. 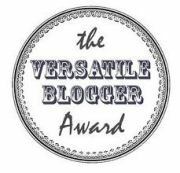 A BIG BIG Thank you also to Brianne Huwe and Mummy Flying Solo for their nomination for the Versatile Blogger Award. Please head over to their blogs too. Instead of creating two separate posts for these awards I am melding them together and passing them both on. 3. Include the award image in your blog post. 4. Nominate 10 other deserving bloggers. What kind of a question is this? Really? Cookies or Cake. This would have to be a pretty nasty world we live in if one day we are made to choose one or the other. I like to believe we live in a society where we can have both. Yes both. No need to choose and no one can make me take sides. I stand for the right to eat both cookies and cake and the freedom to love them equally. Hot apple pie with Vanilla ice cream. Kind of contradicts my answer above. The only time that vanilla will win over chocolate is when it’s sitting atop hot apple pie. And I mean really hot, none of this warm or room temperature or dare I even say cold apple pie. YUCK! I Like it Hot, Hot, Hot. I like to think of myself as an equal opportunity eater, so any time of day is a good opportunity for something sweet. I tend to use Honey quite a bit but if I start a sentence with “Ohh Sweetie Pie..” in a sing song voice, someone is in BIG trouble. I’d love it if someone started calling me Chocolate Thunder! I have never smoked. There was one time at a club with some friends in my 20s where I held a cigarette to my mouth but I had no clue what I was doing and I swear I didn’t inhale. I am much more comfortable speaking in front of a large group than I am in a small setting. I love my birthday. I have no problem with the fact that I am getting older. I don’t always like what comes along with it but I don’t lie about my age and I make sure everyone knows when my birthday is coming. My first job was selling inflatable toys at a kiosk in the mall. It lasted one day. I don’t take sugar in my coffee. People think its really health conscious of me but for some reason cake tastes better with a coffee that has no sugar. I played the trombone for 9 years and I’m considering taking it up again. Nominees: There are some in here that have received similar awards recently so I don’t expect you to go through the process yet again but I did want to recognize your super sweet and versatile blog. Congratulations on your award and thanks!! Ah Mrs LbertyDee, just more proof that the blogs I follow are created by truly amazing people! Thanks for the nomination, much appreciated. Thanks, maybe If I ever do get around to writing that bucket list, I can cross out being called Chocolate Thunder!